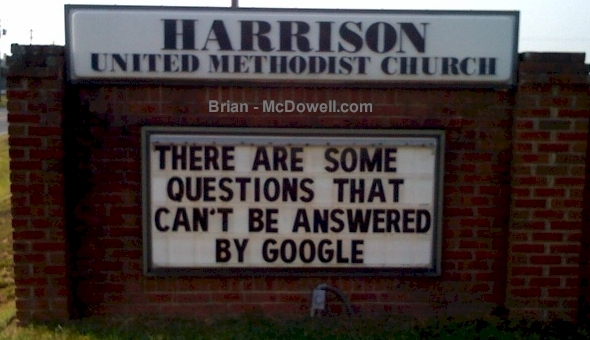 There are some questions that can’t be answered by Google. That is what I saw on my way to work this morning thanks to Uy Ta pointing out the sign on the busy road. The church had this posted on both sides for all travelers to see. I am not sure I am a believer though. Come on, Google has Wikipedia and YouTube right? I have always found an answer after carefully constructing the proper query. According to Francisco Debs, even if Google doesn’t have the answer, it wont be long until they change their algorithm. If you “ASK” me they should have put “There are some questions that can’t be answered by Jeeves”. Ask any tech geek and I am sure they would agree. The funniest part about the sign is its location. 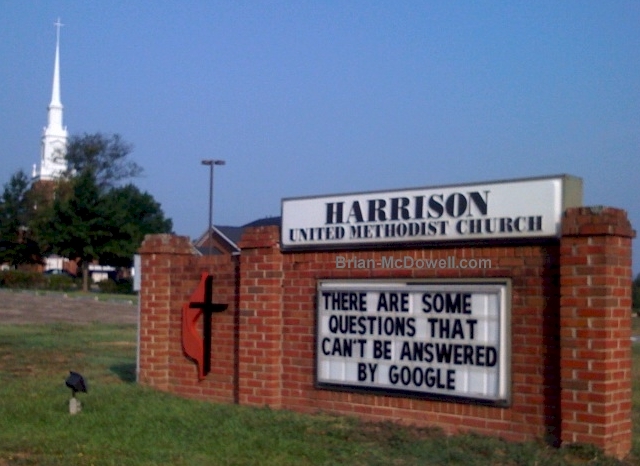 This church is located right across the street of a search marketing giant here in the Carolinas. Red Ventures (one of the few Inc 500 companies in Charlotte) spends most of their time bowing down to Google, MSN and Yahoo. Perhaps they take offense that we consider Matt Cutts a devine oracle and his blog the written word of Google Gods. Each evening before I go to bed, I get on my knees and pray that the competitors don’t knock me out of the #1 position in my sleep. Each morning I wake up, and am delighted by reports of CPCs, CTRs, CPAs, SERP positioning, impressions and conversions. After careful deliberation of the koan expressed by the church above, I have to agree with them. There is one question I have been devoting my life to find an answer to. A question that has plagued me throughout my journey on a road to enlightenment. It has been filled with great joy and sadness with each shift and PR update. Google, what is thy algorithm? Religion is a touchy subject. I feel it necessary to end this post with a quote from Jet Li as he and I share a very similar view. Is there a religion that is superior morally and spiritually with respect to all others? I strongly believe the answer is no. Sure, religions differ from one another in their outward trappings, in the Gods their followers worship, in the customs and rituals which their practitioners observe. But upon closer inspection, the underlying heart and central principle in every religion is the same. Every religion boils down to love, to a respect for all living things, to choosing peace over violence as a means of resolving a conflict. The essence is universal; it is only the means to the end that varies.